Although circumstances often change in the blink of an eye, people tend to change at a slower pace. 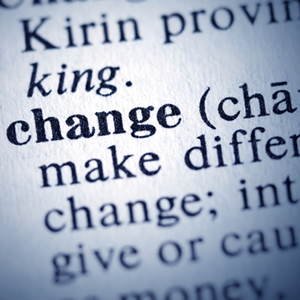 Even the most motivated people who welcome change often encounter stumbling blocks that make transformation more complicated than they’d originally anticipated. Whether you’re hoping to lose weight, or you’re trying to convince your employees to embrace a new procedure, don’t expect immediate results. Instead, recognize that real change happens slow and steady. When two psychologists, Carlo DiClemente and James O. Prochaska, studied people who were trying to quit smoking, they discovered five stages that can be used to assess a person’s readiness to make change. Their ideas about the stages of change have been applied to people who are creating a variety of changes in their lives, whether they are looking to establish new behavior or extinguish old habits. Their research has become paramount to the Transtheoretical Model of Change. It shows that trying to force someone to change before he’s ready isn’t likely to be productive. For example, most New Year’s resolutions don’t last because people don’t go through the stages of change. Instead, they try to create change based on a date on the calendar, which may not coincide with a true readiness to transform. 1. Precontemplation – If you’re precontemplative, you won’t recognize any need to change. Other people may express concerns, but you’ll deny that a problem exists. Unless someone raises your awareness of the problem, you likely won’t choose to do anything differently. For example, a doctor hoping to get a precontemplative person to consider developing an exercise routine could provide education about the health risks associated with inactivity. Explaining the potential consequences of staying the same could help move a person into the next stage. 2. Contemplation – When you’re in stage two, you will recognize the potential consequences of not changing, but you won’t yet be fully commited to making a change. For example, an employee may recognize that he’s at risk of losing his job if he doesn’t increase his sales, but he may still be resistant to trying a new sales technique because he’s not quite sure the risk is worth the benefit. Moving to the next stage requires recognition that the benefits of change outweigh the risks of staying the same. 3. Preparation – During the preparation stage, a plan for creating change is established. An entrepreneur who is finding himself unable to pay the bills, may create a plan to address the problem during the preparation stage. He may decide to sell some equipment, change his marketing plan or find a new strategy to increase revenue. Resist the urge to move through this stage too quickly. Devote plenty of time and energy into creating a good plan that will set you up for success. 4. Action– The steps created during the preparation stage get put into place during the action stage. It’s where your behavioral change finally begins. For example, a person who is commited to lose weight will begin exercising and changing his eating habits during this stage. 5. Maintenance – Two days into the action stage, you may be tempted to declare victory and think you’re well on your path to success. But, if you don’t consider how to maintain change over time, you may struggle with obstacles along the way. During this stage, it’s important to monitor your progress and plan ahead for possible problems and pitfalls that could cause you to resort to your old behavior patterns. For example, a person looking to maintain a healthy diet may need to plan ahead for the holiday season where it may be tempting to skip workouts and indulge in high calorie foods. If you are trying to get someone else to change, whether it’s a family member or an employee, don’t assume other people are ready for concrete behavioral change right away. Identify what stage of change the other person is in and help them move through each stage. For example, if you want your employees to start doing something new, don’t just expect them to spring into action. Instead, talk about the pros and cons of change versus the risks and benefits of staying the same if they’re not yet ready to implement the change. Show other people how change will be helpful before expecting them to behave differently.